Two young composers who are alumni of Canadian Mennonite University (CMU) in Winnipeg recently had their compositions performed by a choir from their alma mater. 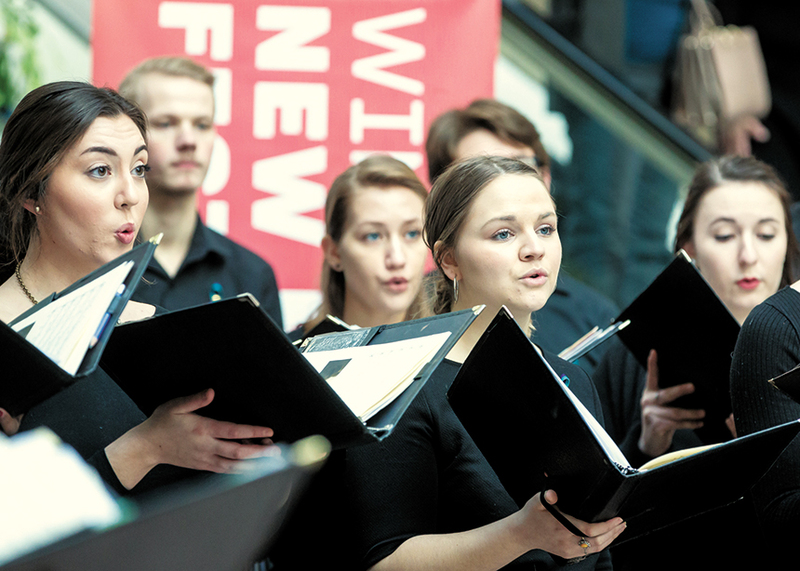 Jesse Krause and Mark Holmes à Court contributed a total of three choral pieces for a pop-up concert at Winnipeg’s Portage Place Shopping Centre given by the CMU Singers on Jan. 29, 2019, as a part of the Winnipeg New Music Festival. The Singers’ repertoire focused on music that explored the theme of gratitude and praise for land, for its creatures and for the work of the Creator. Krause, 33, is working as a composer and music teacher in Winnipeg, and is also currently pursuing a master of composition degree at the University of Manitoba. He contributed two pieces to the concert. One, entitled “Grace,” is music set to a George Herbert poem of the same name. It was sung by the male singers. The other, “Arbor Una Nobilis,” was originally written to be sung at Winnipeg’s St. Margaret’s Anglican Church on Good Friday. It’s about a tree that’s aware of being harvested, although it doesn’t know for what, but eventually it is used as Jesus’ cross. À Court, 24, who is currently a graduate student of music composition at York University in Toronto, says his a cappella choral piece, “Ad Astra,” was originally written last year to be performed in the Via Rail station in Winnipeg. “I wanted to write something that could reach up high [to the high ceilings of the building] and have a lot of breaks in it, so you could hear the voices bouncing off the walls,” à Court explains. “Ad Astra” means “to the stars” in Latin and is based on a text by Seneca. The full text is about trying to reach the stars. Krause attended the concert at Portage Place and said that, although the venue was noisy and some of the intricacies of the pieces were difficult to hear, it was a joy to listen to. “They’re bringing choral music into a setting where it wouldn’t be necessarily. It’s a pretty cool thing for the New Music Festival to do and for CMU to be a part of it,” he says. For à Court, having his piece performed by the CMU Singers was gratifying. He graduated from the university last spring with a bachelor of music degree. “It’s super cool! I’m actually hoping to visit Winnipeg in March, and hopefully the CMU Singers will be able to perform it for me,” he says. Both Krause and à Court say their CMU experiences contributed to their love and knowledge of music composition. “Getting to work with different composition teachers and working in choir, I got to know how things work in a choral setting and how to write music that’s singable. It gave me the tools to know what’s effective,” à Court says. For Krause, the theology courses gave him a grounding from which to write sacred music. “The musical training I received was pretty invaluable, but what was most valuable to me as a composer was the theology courses that I took. That’s had an influence on how I think about music and what it should do. It’s why I’m writing sacred music in particular,” he says.